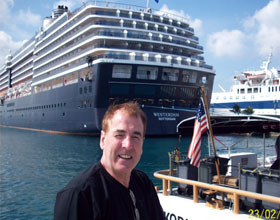 Dec - yep, I get to cruise on some huge ships. This time, in The Caribbean. This is the current best thinking on how a Smash Hit Vocal is arrived at in the studio. this can lead to record deal, songwriting deals, publishing deals ... who knows? How to go from a mediocre, ordinary vocal sound to a Smash Hit 'money in the bank' sound. "The most questions I always get are about equipment that will improve a vocal. So I thought I would lay out a list of all the ways that most guys feel a vocal can be improved .... I will post what the Industry considers to be the most important .... in order ... on a site page within www.makehits.co.uk with the reasoning's. I will reveal the page when I announce the winners - so you know that it is all for real. the order will be determined by a bunch of my Successful Industry studio pals. The winners will be those who guess the right order or get closest to it. The winners will be published in 'One Minute'." The Microphone, the preamp, the digital recording medium, the compressor, the effects unit/units, the monitor speakers, the ambience [acoustics] of the monitoring area, the earphones used, the ambience [acoustics] of the recording space, the performance of the vocalist, the experience of the producer, the mastering of the finished product, the skill of the vocal track editor, the amount of rehearsal time used by the vocalist. So now ... what is the best current thinking of the importance within the list? Without a shadow of a doubt, it is the most important part of a hit record ... it is what the public buy, then dream about ... then lust over .... the performance of the vocalist. that magic, that passion, that loveliness and lusciousness. I am well known for saying "never go near a studio without the best Hit Producer you can afford". 3) The amount of rehearsal time used by the vocalist. An old fashioned concept? Don't you believe it. Any 'today' artist will spend hours and days rehearsing and 'getting to know the song' before a session day. That familiarity with the song just oozes down the mic. ... through the wire and into the recording medium. Sadly, most songwriters feel that they 'know' the song ... WRONG! They may know the melody and may know the words [just about] ... but they certainly don't know how the best can be got out of the performance. My brother, who does most of the lead singing in my band will take a week to get to full performance level when recording an unknown toon ... true! And most singers, if they owned up, would feel the same way. And, by the way, live singing in the quickest and best way to familiarise yourself with a new title. But please, please, please always leave 10% for the Hit Producer to manipulate ... never issue that feared phrase: "but I've rehearsed it so much that way that I can't change!" ... a Phrase known to make any producer feel like jumping off a bridge! Or at least shake uncontrollably with fear - whilst reaching for the brandy bottle. I have read and listened to so many amateurs shooting their mouth off about this microphone and that microphone for vocal purposes. The fact of the matter is that even the most expensive, respected and lusted after microphones will sound rubbish in an acoustically unprepared recording area. My favourite phrase to describe this is "sh*t in, sh*t out" ... s'cuse me ladies! Meaning that the microphone will only pick up what is presented to it. So - if the vocal is performed in an echo laden room with a hard floor, hard walls, high ceiling, windows without curtains - then the vocal sound will always be thin and weedy. Again, so overlooked by home recording folk .. and sometimes even by professional studio folk. In professional studios a lot of money will be spent to ensure that the live area and the monitoring area are acoustically treated to give the optimum sound. Sadly, the home recording guy will feel that the important factors are the microphones, compressors, effects units and the monitor speakers. Yes, the next most important point will be the monitor speakers, but any monitor speaker system will sound God Awful in a poorly prepared monitoring room. The current best thinking is that excellent results can be obtained by recording and listening in the same area. What do I mean by that? It is my preferred working method, by far. Great control room acoustics, live area and monitors - just the best. My studio has no control room .... amazed? I much prefer to work in a perfectly acoustically prepared area where the singer/musician is no more than six feet away from me. That way I don't have the problem of getting out of my director's chair, walking over to the acoustically treated sliding glass door, walking to the singer/musician and discussing the performance so as to enhance it or repair it. Yep, I can just stop the recording machine and chat about the performance in a very informal way. He/she can listen back where standing or move three feet to be beside me. I use quite a sophisticated switching system for switching the monitors on and off so that when recording they are off and the earphones are on. Then when listening back I can switch the monitors back on. The only downside of this system [that I have found] is that the microphone has to be switched off any time the monitors are on ... otherwise we get monstrous feedback. I notice that newly built studios have these facilities or may have a tiny isolation booth for a drummer or vocalist who prefers to be 'on their own'. You see, most of the work, nowadays is done by layering, so it is very seldom that a large live area is required for recording .... dead space in a studio = dead money in a studio. So, by combining the listening area with the live area it is easy to achieve an excellent acoustic ambience.... perfect for monitors ... and for recording. PS: ensure that the computer tower is outside the studio and the least amount of equipment is on during recording. It can be amazing the amount of unnoticed electrical hum that is present in even the quietest studio. Absolutely essential when involved in money making hit music and other forms of music that sells. I find it tragic that well intentioned home studio guys will mix and monitor vocals on tiny Hi Fi speakers. Or worse still, those tiny speakers sold with PC computers. It is simple to do a Google search on the hit making studios and see what they are using. And what would they be? The biggest selling, and now discontinued, monitors ever in history. Responsible for hundreds if not thousands of hits, worldwide. NS10S made by Yamaha .... and now not available as new. Reason was given by Yamaha that they could no longer source the wood that the boxes were made of. Do you believe that? I don't ... for one second. 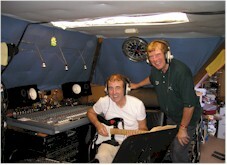 Studiospares in the UK do a 'lookalike/soundalike' version which I suggest to members ... they love 'em. The normal set up for a money making studio is a set of NS10S for near-field monitoring ... meaning close to your ears, so they are a comfortable level for recording and tracking .... and extremely true for mixing. You will also note that you will find them in every studio throughout the world... it then is a standard sound. Next a set of high quality Hi Fi speakers which will emulate what a fan of good quality sound will expect in his living room. Then the full, Technicolor mega jobbies for listening at high SPL [Sound Pressure Level] These are usually for final checks of a mix and to impress visitors to the studio .... incidentally that is the only time mine get switched on. It is essential, by the way, to drive these monitors with the highest powered amplifiers you can afford. Be aware that high wattage will never destroy speakers but low wattage will, when the amp. starts clipping [switching itself off at high level to protect it's circuitry]. Explaining that in lay man's terms: high wattage will be like a Rolls Royce going up a hill ... no problem .... but a mini will struggle ...yeah? Also, technically, the high wattage will have little harmonic distortion ... so the sound will be clean and pure. Just the opposite of a small transistor radio at high level? You notice I did say 'digital'? You would be shocked at how many guys still record on cassette ... on multi track cassette [remember those 8 track Tascam cassette recorders?]. Also, there are many out there who seriously feel that there is untold 'warmth' in tape recording. They totally forget that the public are brainwashed with superb, high quality digital recording... so, tape recording would just sound dull and horrible to them ... they are not old time tape freaks. They are the modern day record and download buying public - sorry! So which digital recording medium? The world industry standard is Pro Tools, no matter what way you look at it, or which Music Newsgroup you may contribute to ... now.... Protools comes in two versions, basically. The domestic/home studio version which is massively powerful and generally supplied by Digidesign. The starter version is, at the moment, MBox2. This is a fully functional Pro Tools which will operate on a Mac platform [computer] or a PC platform. My suggestion would be Mac, as it is vastly more powerful and reliable ... used by EVERY major studio. Many PC enthusiasts will argue backwards and forwards and sideways about this fact. But ask them a simple question: "how much do you have in your bank balance? From your music?" The next stage up would be my preferred Protools .. that is Digidesign 003 currently. This provides 8 individual outputs for using outboard effects and compression etc. MBox has only two outputs, so is quite limited. The ultimate Protools is the HD version .... involving massive hard disc capability and currently the most powerful recording equipment in existence... with a price to match...starting around £16,000. Now we get on to the magic part of creating a vocal. Not essential, and despised by a lot of amateurs and novices. Essential in making a hit record sounding vocal. The reason, I feel that so many amateurs ignore them, and/or despise them, is that they simply do not know how to use them and they certainly do not appreciate the excitement they give to a vocal. A well used compressor will bring the entire vocal up to a constant level. So there should be no need to 'ride' the vocal fader. Meaning pushing the fader up and down for quiet and loud passages. A professional singer will not give quiet and loud passages as they will be skilled in making a vocal 'sound' quiet whilst still delivering the same 'loudness'. This is essentially what a compressor will do. The quiet parts will 'sound' quiet because the timbre of the voice will change but audibility of the vocal will be the same - you will have no problem hearing it. The use of compressors has even gone further now. They are used to provide hardness and excitement. They will exaggerate breathing noises and increase the sibilance. They will give an indefinable edge to the vocal which makes it altogether more exciting. The vocal gets pushed forward in front of the speakers. I won't go into the details of the use of compressors here, there are many fine articles on line that will do that. My advice is to get a compressor [my current favourite is the TLA Audio Fatman - Fat 1 .. stereo valve driven compressor much favoured in top Hip hop circles]. Just use it ... experiment with it. There are presets in the machine which are so useable and also a manual side where you can set your own settings. Mastering is the black art that 99.99999% of home recordists do not understand. It makes the difference between a demo and a finished ready to make dosh record. And don't even think of using a computer finalising programme or even the Finaliser hardware ... mastering is a job for the experts in the dedicated mastering suite ... which, incidentally, will simply have the speakers and little else in, except the essential equipment. Mastering is never performed in a recording studio. We are talking here of making 'perfect' product ready for duplication and onward sale to the Public. The 'Sadie' equipment is much favoured, but most guys now use very powerful dedicated mastering software through Protools on hugely powerful Mac computers. The software will generally be self powered, meaning that it does not depend on the CPU [Computer Processing Unit] of the computer... generally cost around £2,000 a card. Sadie is still used for placing the start points of each track and for bringing the whole track up to maximum DB [Decibels] of sound volume. This is a skilled job. If the artist has had many 'drop-ins' .. meaning that many parts of the vocal had mistakes, bad tuning etc. that had to be replaced, then there will inevitably be clicks, bumps and evidence, through breathing difference, that the track was much edited. This is where Pro Tools shows it's power. There is an automatic programme which will strip the sound between each vocal line ... called 'strip silence'. This is wonderful and quick - if no breath is required ... in, such as, a dance track. If breath sound is required then the genius vocal track editor comes in. He can spend hours cross fading tracks and being a perfectionist, so that no one would ever believe that the vocal track was not all done in one go. Of course, he will come into his own with the multi tracked vocal arrangement where there will be so much extraneous noise, bumps and clicks. He will clean up the start and finish of each phrase and make them all 'perfect'. As a vocal arrangement 'expert' I tend to do this editing myself. He will also make sure that the entire vocal track is sounding at the same level. Sometimes a vocalist will be required to come in a few days after the session to correct a mistake. It then requires a skilled track editor to make the new section sound the same and appear the same level as the rest of the vocal track ... this involves great skill and knowledge. In 'comping', meaning composing a final track from a number of complete versions of the vocal track, a track editor has to be incredibly switched on. It is complex, requiring skill and the ability to remember various sections of tracks and, of course, taking accurate notes. Comping is essential where an artist or musician insists that they want to do an entire take on the song. They may do twenty takes and the track editor will have to piece together the best of each track... complex? I personally hate working like that and prefer to correct and drop in as the vocal session progresses. That way I know that I have a complete, perfect vocal track before the vocalist leaves the studio. With comping, the vocalist will issue the immortal words: "you have enough there to work with, I have to go now and holiday in the Bahamas/have a brain operation/scratch my bum/go to a great party" ... take your pick from any of those 'lazy' excuses. You will want to drive down to Eastbourne in the South of the UK and hit me when you hear the professional opinion of the importance of microphones. Unless you are recording Andrea Bocelli with a symphony orchestra or a choir at Kings College then the microphone is of little importance. Getting back to the first and most important point - the performance of the vocalist, the microphone simply captures that magic. You heard me say "sh*t in - sh*t out" .... that is precisely what happens. Most microphones will capture sounds from 30Hz to 20,000Hz. The vocal frequency range is thought to be 200Hz to 2,000Hz. So, it goes without saying, that any microphone will 'grab' that range of frequencies. And that is what a microphone does... it 'grabs' the frequencies. The difference between the various microphones is that the graph of the fluidity [my that is a complex word?] of the receiving of the sound can be different ... only slightly, but enough for some folk to notice. For instance, the renowned Shure SM58 will accept more in the high mids, which has resulted in it being the industry standard for vocals, throughout the world, in almost every live situation [and even recording - Manic Street Preachers?]. Various artists, with knowledge of their own voices, will have found the ideal mic. to suit their voices and be in a position to demand that mic. whenever they perform. When used in a home studio they can pick up all sorts that you don't want to hear ... my problem is seagulls as I live close to the sea! The sea views are beautiful but I could shoot those little birdies sometimes. Especially at nesting time. It is worth understanding that, in a modern Pop recording we will use so much compression and effects that it is easy to forget, completely, what microphone was used in the first place ... I know - that happens to me often. I will own up now and say that I have only used a pre amp in one studio in my life. That was in conjunction with a mega expensive Neumann microphone. It took me about 45 minutes to get a half decent vocal sound .... so.... never again. I tell a lie, I did use a Joe Meek pre amp. another time, in my own studio ... at the request of a friend. Again with a Neumann ... same deal! Hours of agony. And the noise? The results reminded me of a demented horse falling down a well. I find that when I just plug a few mics. straight into my Protools or Roland VST [my favourite for quick easy work] then I choose the best mic. for the job and get going quickly. I have never yet seen any difference between mics. plugged straight in and mics. plugged into a preamp. The accepted idea of preamps is that they are super clean and quiet in operation, with a desperately low noise floor. So therefore, in theory, if you plug in a mic. with a similar low noise floor and then by-pass the preamp of the mixing desk or the analoque/digital interface going to the recording computer programme, then the result should be super quiet. Some preamps will have compressor/limiter built in and a very detailed EQ [equalization or tone controls] so you can give the vocal a lot of attention as it is being recorded. The big 'however' here is that once compression is applied it cannot be removed later ... so it is dangerous to record in this fashion, save having a light limiting setting. That means the mic. will not, in theory, overload the system when recording, so you never miss that 'magic' take through distortion. Similarly with EQ. Most experienced engineers and producers will record the vocal flat [no EQ] and leave the changes, if they are necessary, until the mixing stage .... So .... should you use a preamp? In my view they are not necessary. I say extremely dangerous for good reason. Most of the Demos I get sent through our 'Demo Consultation Service' either have too much of an old fashioned reverb or echo or they have too little. Reverb and effects use is only learned through study of the units involved and by constant study of the effects currently used on chart records. Then it is down to daily use. Of course, it goes without saying that you must have a unit that is user adjustable. Most of the smaller desks designed for small home studios or small live rigs will have built in digital effects. Sadly, they are not very usable. The Behringer range, for instance, have all the reverbs set too long. This is sad as I have a soft spot for these excellent mixers. Likewise, older units like the Alesis Quadraverb had very usable patches but had quite a high noise floor [inherent noise]. It also had a grainy sound, compared with the current crop of units. Roland are not known for their effects units but produced the elderly but excellent SRV-3030 .. they also include beautiful effects on their VST [Virtual Studio series of hard disc recorders] They include the almost essential RSS [Roland Stereo Sound] effects which throw the sound way out past the stereo speakers .... as used in almost every girl Hip Hop record. The most expensive effects units currently are the Lexicon 960 and the Digitech lookalike of the same unit. As used by Il Divo. Pure, clean, transparent. Could you afford this Lexicon 960? 1) Get to know the various Industry Standard units ... study the manuals [available on the Net]. 2) Realise that a normal small studio will have a Lexicon 480 [or the latest 960] but the engineer will not have bothered to learn how to use it and simply give you more or less of the patch that is set as standard for everyone. 3) Understand that a unit will sound totally different in a live situation. The current best, for live work, in my view, is the Alesis Midiverb 4 ... quite the best I have ever heard ... and not expensive. 4) Learn how to adjust the echo length and/or the predelay length to the tempo of the song. In rough terms divide the BPM [beats per minute] into 60 to give you the millisecond delay for a quarter note [crotchet]. You can then divide or multiply this by 2 or 4 to give the required effect. 5) Learn the use of 'chorus' to fatten vocals, particularly back vocals and vocal arrangement ... also the use of RSS. 6) Understand that normal reverb will push the vocal back into the speakers. Using predelay or a unit giving an echo with the reverb after the echo will ensure that the vocal is clean and upfront with the reverb tailed behind. 7) Understand that computer 'plug in's' are low quality, of necessity, as they use the CPU [computer processing unit] of the tower. You will run out of recording power very quickly unless you are using the self powered cards as described above. You will have to tell me how you afford these? Drugs? Arranging wars in Africa? Selling your sister? The reason we only use one type of earphones [Beyer Dynamic DT100] is that every studio in the world uses them, so no matter where you record you will have the same earphone sound. They are high SPL [Sound Pressure Level or volume] and should not distort in any way even at their loudest. They are also clear and have a well defined frequency range which is excellent for reproducing vocals. Most producers and free lance engineers will carry their own sets [just in case the studio does not have them]. The all enclosing ear-pads make them the best for recording vocals as no music spill should get into the microphone unless they are at earsplitting, blood boiling, kidney shattering level ... but you wouldn't do that would you? Many novices will spout on about the benefits of various other earphones but don't ever be tempted to stray from Beyer DT100. Beyer do an extended bottom end version [DT150] but I would not advise ever straying. "The most important thing is to learn how to learn"
This all works for world class Rock 'N Roll, Hip Hop, R 'n B, Soul, Country, Pop ..... this is dosh making show biz .... not for 'locked in the pub circuit' no-hopers. Studiospares http://www.studiospares.com/ for prices and info on all equipment.